The cover for my science fantasy, THE WOLVES OF PORT NOVO, the Novel Formerly Known As Eel’s Reverence, continues apace. I’m working on the back-cover blurb. Elderly priest of Holy Sweet Micah, Aunt Libby, leaves her parish in a huff and walks into danger. Not from the young tough who robs her, not from the pragmatic waterfront restaurateur who gives her the briefest possible shelter, but from fellow priests. “Reiver” priests, mercenary and cynical, have driven all true priests out of Port Novo and plan to expand their power as far as possible. One old woman isn’t going to stand in their way. Now, here’s an excerpt. Aunt Libby is the narrator. She has been chivvied out of town, but has been found in the woods by Uncle Phineas, one of the reivers, who has also collected the two people who’ve come in contact with Aunt Libby in her brief stay in Port Novo. A mermayd is what makes this science fantasy, not just fantasy: mermayds are just like mermaids, except they’re not fantastic creatures, they’re another sentient species, non-mammalian and with no fixed gender. A WRITING PROMPT FROM ME TO YOU: Have you ever been asked to leave a place? 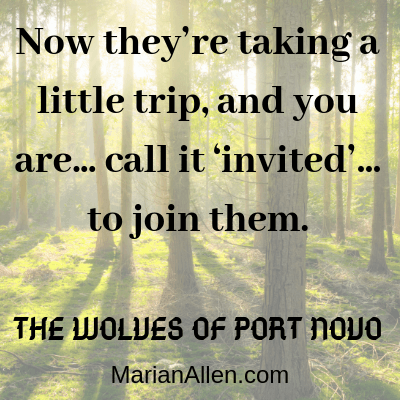 This entry was posted in EEL'S REVERENCE, Sample Sunday, WOLVES OF PORT NOVO. Tagged strong female character. #SampleSunday – Kick Me, Baby! That is a good blurb. I’d pick that up and start reading.